Office of Greenways & Trails Connections Newsletter Spring 2014. Withlacoochee Gulf Preserve Paddling Trail Designated. For kayakers looking to get outdoors for a leisurely paddle, a tour up the Withlacoochee Gulf Preserve (WGP) Paddling Trail could be just the fix. Stationed off of Levy County's State Road 40, among serene lakes, salt water marshes and pine and hardwood forests, sits Bird Creek Park and within, the southern terminus of the WGP Paddling Trail. This trail, on March 19, became the most recent blueway approved by the Florida Greenways and Trails Council for designation into Florida’s Greenways and Trails System (FGTS). The park that marks the trail’s beginning offers visitors a variety of open-air, recreational amenities comprised of picnic and grilling posts, shore fishing, a swimming area, as well as a canoe and kayak launch site. Guests departing from this depot and steadily traveling the 2.25 mile course north, will find their way to the 413-acre northern terminus of the Withlacoochee Gulf Preserve in Yankeetown. At this end users are met with another launch station, in addition to several nature trails, an observation tower, an education center as well as more picnicking and sitting areas. Nature lovers, outdoor enthusiasts and paddlers of every skill level paddling the short distance between the paddling trail’s launch stations, or on to the Florida Circumnavigational Saltwater Paddling Trail’s Nature Coast section, will have an opportunity to enjoy the beauty and scenic views of natural Florida. Signs for a designated greenway, site and trail. The Florida Greenways and Trails System (FGTS) Designation Program has a new sign! One of the most effective ways to highlight your trail, greenway or site’s status as part of the FGTS is to display the colorful FGTS sign. The FGTS sign can be used for on-site signage, publications, websites or other media promoting your greenways and trails. There are signs for designated greenways, sites and trails. To learn about the Program and how you can get your greenway or trail designated, visit http://www.dep.state.fl.us/gwt/FGTS_Plan/designation/. For more information or to obtain a high resolution version of the sign, contact Marsha Rickman at marsha.rickman@dep.state.fl.us or 850-245-2050. The Florida Department of Environmental Protection’s Florida Park Service finalized an agreement to seek sponsors for seven state trails. Last month, it was confirmed that Bike Path Country will act as an intermediary on behalf of the state to seek and provide corporate sponsors on seven state trails. The trails include Blackwater River Heritage Trail, Tallahassee-St. Marks Historic Railroad State Trail, Nature Coast State Trail, Withlacoochee State Trail, the Florida Keys Overseas Heritage State Trail, General James A. Van Fleet State Trail and the Palatka-Lake Butler State Trail. Signage will only be placed at trailheads and access points authorized in the agreement. The displays can be no larger than 16 square feet at trailheads and 4 square feet at access points. In addition, Bike Path Country and the sponsors will also provide cross promotional activities at no cost to the state. The contract is initially for one year and will provide the state 50 percent of gross revenue obtained from sponsorships. Renewals will result in a one percent increase to the state each year for up to five years. This segment of the Pinellas Trail in downtown Dunedin will be part of the Coast to Coast Connector. The Coast to Coast Connector (C2C) is an ambitious effort to provide a safe and continuous recreation and transportation multi-use trail from the Gulf of Mexico to the Atlantic Ocean through Central Florida. When complete, the C2C will be approximately 270 miles. At present, an estimated 75 percent of the corridor is funded for completion or developed and open to the public. The C2C will link communities between St. Petersburg and Titusville along its entire length into a major destination route that will allow residents and visitors to explore Central Florida by bicycle or on foot. The C2C includes portions of several trails, include two of the state’s most popular trails, the Fred Marquis Pinellas Trail and the West Orange Trail. Both of these trails have fueled the economic transformation of local communities. The C2C serves as a model for regional and state partnership. At the local and regional level, much of the Connector has been evolving over the last couple of decades as individual trail projects, often led by local governments and metropolitan planning organizations (MPOs). These entities have been supported through a range of local, state and federal funding sources. At the state level, the Florida Department of Environmental Protection (FDEP) and the Florida Department of Transportation (FDOT) are working in close partnership to advance the project. As the lead entity for statewide greenways and trails planning, FDEP’s Office of Greenways and Trails (OGT) has drawn from local and regional plans to develop the Florida Greenways and Trails System Plan. Each agency and organization involved continues to work collaboratively to evaluate and prepare the remaining gaps to ensure their readiness as funding becomes available. Because of the range of status for the various gaps it is difficult to set an exact completion date. However, one target is to have at least the first phase of every gap under way and all funding identified and programmed within five years. The C2C is a key priority in this plan, along with more than nine other long distance corridors in the system for the entire state. The Florida Greenways and Trails Foundation, OGT’s official citizen support organization, has simultaneously played a key role in promoting the C2C and the need to close the remaining gaps. All of this combines to lay a strong foundation for FDOT to make the project a focus for funding within Florida’s state transportation work program. Once the C2C is completed, it will be an incredible draw for residents and visitors as the only long distance trail providing a seamless, non-motorized connection between the Atlantic Ocean and the Gulf of Mexico. 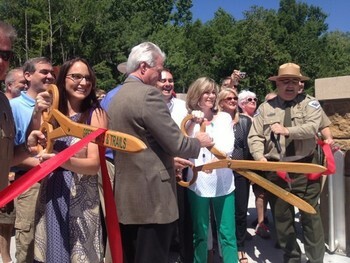 DEP Deputy Secretary Katy Fenton and other dignitaries cut the ribbon at the ceremony. State and local representatives celebrated the opening of a multi-use trail and bridge in Dunnellon on May 16th. This new trail and bridge brings the state within two miles of connecting the Withlacoochee State Trail to the Marjorie Harris Carr Cross Florida Greenway. The 280-foot bridge spans the Withlacoochee River. The 12-foot wide, 2.4 mile paved trail features two trailheads; one in Citrus County and one in Marion County. The construction was made possible with funding from the Federal Highway Administration’s Transportation Alternatives Program through the Florida Department of Transportation and the 2009 American Recovery and Reinvestment Act. This project began in October 2012. The Cross Florida Greenway is a key component of the Heart of Florida Loop, a multi-county regional greenway network, which is part of the larger statewide Florida Greenways and Trails Priority System. Connected trails provide recreational, economic, alternative transportation and quality of life benefits to local communities. CT thru-paddlers Carl Anderson, Ian Brown, Jim Windle, Marc DeLuca, Gus Bianchi and Daniel Alvarez. About 30 paddlers gathered at Silver Springs State Park on the third weekend in May for the inaugural Florida Circumnavigational Saltwater Paddling Trail (CT) gathering. 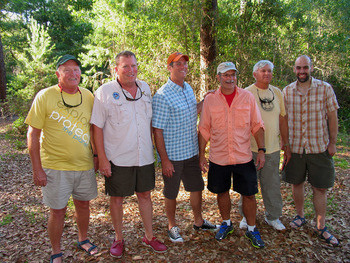 Six sea kayakers who paddled the entire trail were among the group and they shared stories of adventure and humor. “You read that sand gets everywhere. But it’s not until you have grit in your oatmeal that you realize how true it is,” said Marc DeLuca, who finished the trail with his partner, Jim Windle, earlier this year. Other attendees included those who were paddling the trail in segments and some who planned to embark on the 1,515-mile journey in the near future. Helpful residents who live along the trail, often called “trail angels”, were also recognized and given special CT t-shirts and other gifts. Liz Sparks of OGT organized the gathering and she hopes it will be an annual event that builds upon itself each year as more people complete the trail. Besides the public event, the group paddled the Silver River, enjoying a dose of fresh water for a change. Besides OGT and the Florida Park Service, other sponsors included the Florida Paddling Trails Association, Marion County Parks and Recreation, and the Genesis planning group. 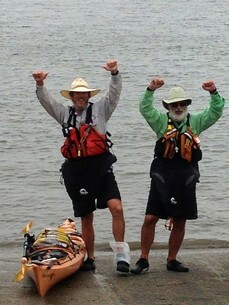 In the Winter 2014 edition of Connections, readers may recall reading the article about kayakers Marc DeLuca and Jim Windle, two retired police officers from Charlotte, North Carolina, who were in the final stages of completing the 1,515-mile trek around Florida’s Circumnavigational Saltwater Paddling Trail. The pair began their four-month journey Nov. 2, 2013, at Big Lagoon State Park near Pensacola and finished March 1, 2014, near Fort Clinch State Park just south of the Georgia border. They have joined the ranks of an elite few to become the 12th and 13th paddlers to complete the entire trail since it opened in 2007. Over the course of their journey, the two men faced extreme weather, large ocean swells and some health scares. Despite the hardships, they pressed on, vowing not to give up. A multi-media blog capturing their experiences can be seen at http://KayakAroundFlorida.wordpress.com/. Designated as a National Recreation Trail, the Florida Circumnavigational Saltwater Paddling Trail educates paddlers about Florida’s rich history and fragile coastal environment. Following the Florida peninsula from Pensacola around the Keys to the Georgia border, this sea kayaking paradise is often described as the saltwater version of the Florida National Scenic Trail. The trail highlights 37 of Florida’s 41 aquatic preserves and offers paddlers access to numerous state, national and local parks, seashores, wildlife refuges, marine sanctuaries and historic sites.